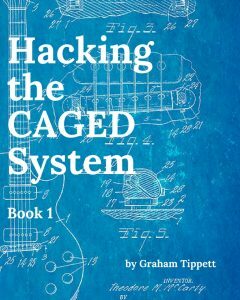 The Hacking the CAGED System series was inspired by my own,and other guitarist’s frustrations with the infamous CAGED System for learning guitar. It all started back in Music College in the early 2000s, at the ACM in Guildford (UK) to be precise, where we were handed, by none other than Guthrie Govan, an inch-thick binder containing all manner of shapes and patterns for the CAGED system, including chords and arpeggios. I duly slaved over the book while burning the midnight oil for an entire semester and while my technique improved no end, I just couldn’t turn those patterns into music,or connect them to what I was learning in music theory class.Fast forward to 2016, and with the benefit of hindsight from more than 20 years of playing, I’ve been able to look at the CAGED system from a different perspective, and one that will hopefully make it a useful system for anyone wishing to learn it. The CAGED system has many flaws, but these can be hacked and rectified to turn it into a powerful system for understanding how the guitar fretboard works, leading to a versatile, and above all, functional knowledge of chords, arpeggios, scales and modes, and key signatures. Book 1 teaches you the basic major scale forms, shows you where to find the basic diatonic chords as well as seventh chords.We then venture into intervals which are the key to making your solos sound like you know what you’re doing. Next we bring out the arpeggios,and finally the modes. Everything is tied together using key signatures as a framework to build up a practical knowledge of chords, scales,arpeggios and modes on the guitar. Unlike the original CAGED System, Hacking the CAGED System provides you with a complete solution to learning chords, arpeggios,scales, modes and key signatures, makes perfect logical sense and is very easy to follow, even for beginner guitarists. No Kindle? No problem… Click Here to Download the Free Kindle Reader App for all Devices! *Also includes 8 full-band backing tracks – download link provided in book.